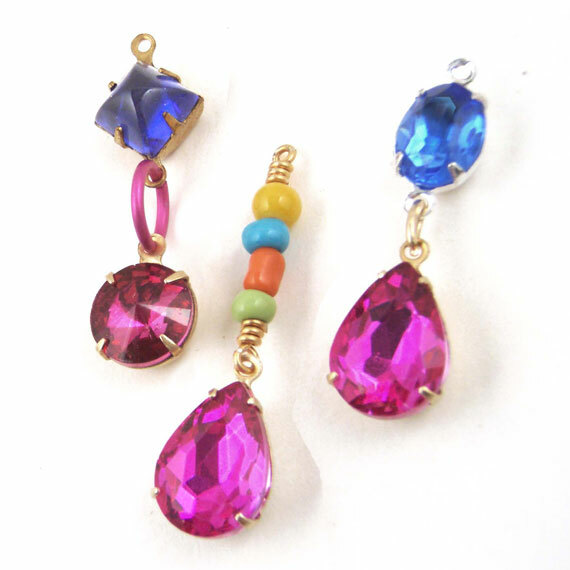 Earring designs – playing with color, Part Two. I think. Yes, I like to play with beads and jewels – they’re my medium, if you like. And I think it’s good to try things that we aren’t “supposed to do”. After I saw that yummy, fuschia pink silk dress (see my post here), I couldn’t resist playing with some fuschia pink jewels. I deliberately grabbed beads and jewels that I wouldn’t usually pair with the fuschia pink jewels. In the example on the left, that big jump ring is aluminum – not a material you expect to see with a classic rhinestone teardrop. 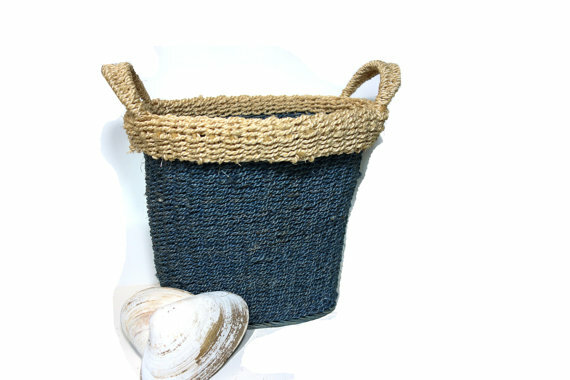 And the upper stone is navy blue. In the middle design, those round(ish) beads are glass E beads – I probably wouldn’t choose those color combinations and those very..hmm…casual beads. But hey, why not try it? 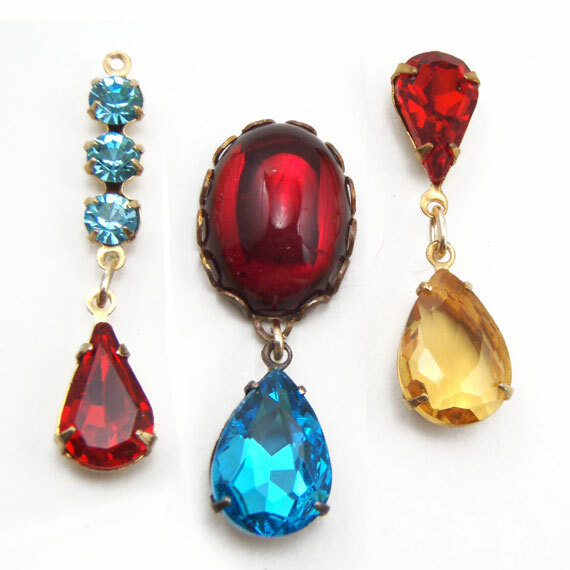 The design on the right has a sapphire blue oval paired with the fuschia pear. And the settings aren’t even the same color. Well, we definitely wouldn’t do that. But – why not? Okay, if it was me, I’d try to use three different settings, not two, so it looks deliberate. But that’s me. You ought to do – whatever feels right to you. 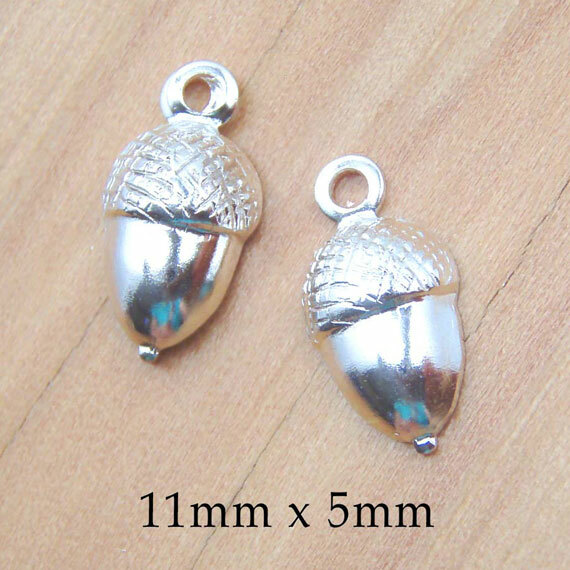 Both gold and silver settings in the same earrings? 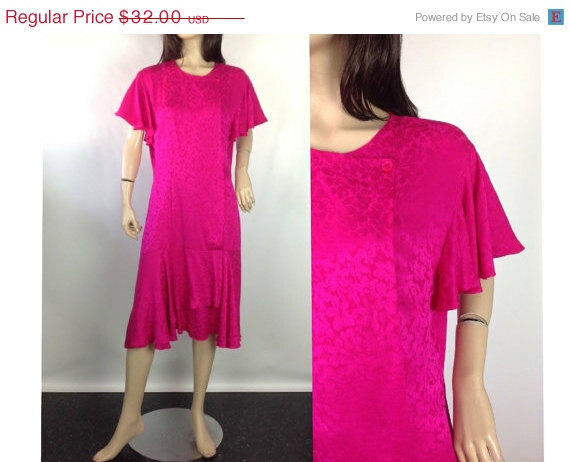 Fuschia pink vintage dress – plus size! Okay, first, this is a gorgeous dress, which is the most important thing. And I almost hate to say it’s “plus size”. A great dress is a great dress! But if you’re a vintage shopper, you know as well as I do that anything larger than size 4 disappears as fast as it appears on the shelves. People are always on the lookout! Wouldn’t you feel like a million bucks in this dress? It’s officially a Size 14 – but look at that shape and style. Anybody from a 10 to a 16 could wear it, I bet. Belt it, wear it with flats for a fun daytime dress, and of course with bare sandals or stilettos for a knock-em-dead party dress. And it’s silk. Now to me, silk is not this untouchable too-good-to-be-true fabric. To me it’s wearable, usually totally washable (the only danger being a bit of shrinkage, so try it if the dress is a little loose anyway) – comfortable year round, because the fabric breathes – and, well, it FEELS good. I found this treasure at Six Cats Fun Vintage boutique on Etsy. Juliet, the shop owner/curator, has some fabulous finds there – and great prices – and colors you are going to love for Spring. Check it out. Seriously, you’re going to thank me! Yes, I’m a closet geek – seamstress. 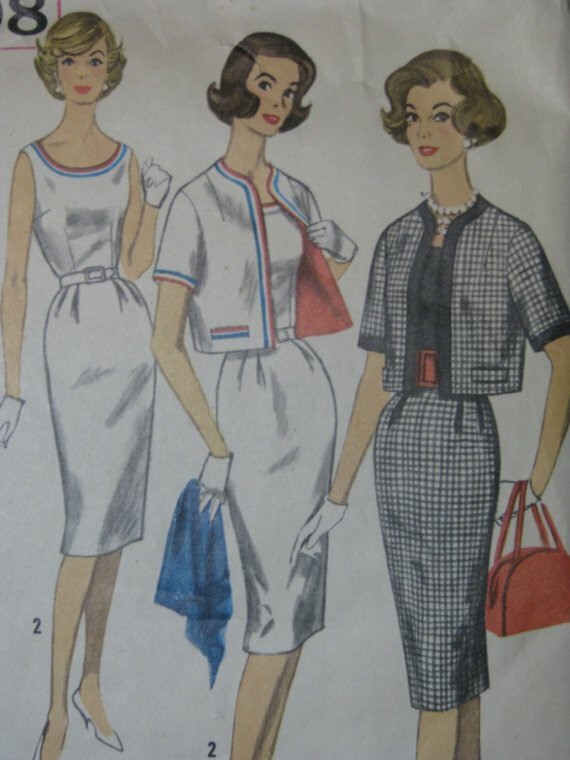 Hey, when you love vintage, and are always looking for great value for your money, and you find a stash of vintage patterns? It’s kind of wonderful. You can see what I mean. I’ve used Simplicity patterns, they generally have good clear instructions, and this dress would not be fussy to make. (Okay, not *super* fussy.) And yet! Think how you could rock this garment. Day, night, dressed down and simple for work, and when it’s time to party? Yowza! I found this yummy pattern at Fripperie, a vintage pattern and sewing supplies boutique at Etsy. Suzanne, the owner, has some fabulous finds there – she organizes her patterns by decade. You will love the hunt! 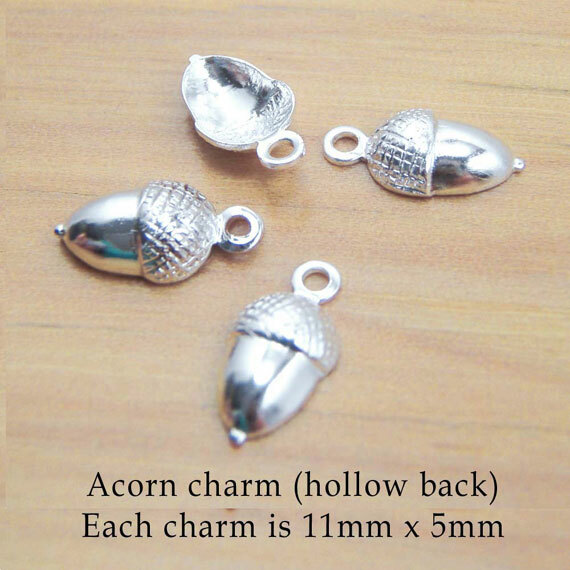 As you can see in the second pic, these little charms are hollow – so they’re very lightweight – perfect for comfy earrings. Also inexpensive. But they’re also beautifully formed – look at the detail! 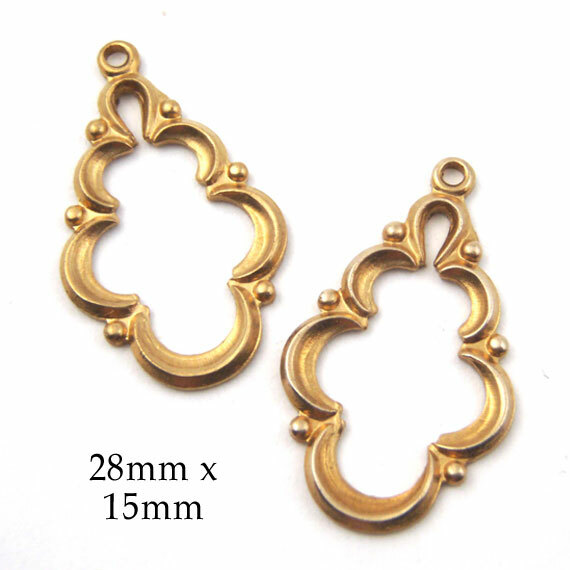 They’re made and plated in the US, and the manufacturer has been a leader in the brass (and brass stampings and jewelry findings) field for most of the 20th century. These charms are the perfect touch when you want to add a little ornament to your jewelry design – or make a minimalist statement. You can see how easily it works. 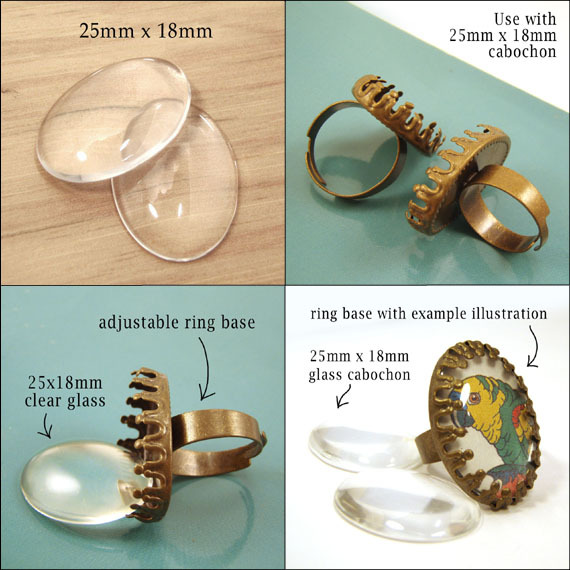 The ring base is lightweight and flexible – and adjustable, so it fits most fingers easily. You just find a graphic you like (the example was from an old magazine ad) – cut it into the oval shape inside the ring base (it should be approx. 25mm x 18mm, or 1″ x 3/4″). Slip it into the base. Add the clear glass cabochon, then gently squeeze the prongs closed. It’s that easy. And you can make one to match every outfit. Or day of the week. Or, maybe, make a typeset graphic saying something you’re just dying to tell the world. “I’m getting married” or “Bite me” or whatever mood strikes you. DIY earrings designs part…next. Play with color! Color is one of the most fun things to play with. And we sometimes forget to experiment and try new ideas. We always use blue with green, or red with black, or, well, just imagine the same-old-same-old combo you’ve been wearing forever. Change the experiment. Break the rules. Or just play. You see what I mean about playing with color – and shapes? Pull out your bead stash, or the glass jewels you’ve been saving. Spread a white cloth (or paper!) on your desktop or work surface, so the colors really show up. Combine shapes you don’t usually use. Play. You’ll find combos you love. I promise.